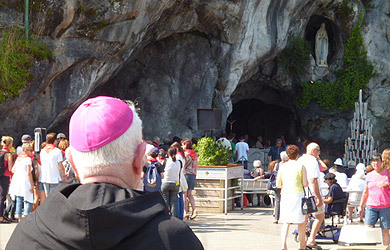 Lourdes is best known for its Grotto, the cave area in the Domain where Bernadette saw Mary and spoke to her. Over 6 million people a year visit the Grotto to pray there. 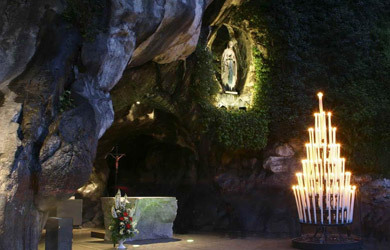 When you are in Lourdes, spend some time standing before the Grotto. You will see people passing through the Grotto and touching the rock, kissing it or pressing their forehead against it. Others will touch the rock with something like a handkerchief. All the actions that you will see there may seem strange at first. What you are seeing is people recognising that they are in a very special place. Here, Mary the mother of Jesus appeared to a young girl about the same age as you. All these people touching the rock wish to be physically close to that wonderful event. This reminds us of the sick in the Gospel; they wanted to touch Jesus or at least touch the hem of his garments. People in need lean on God. They want to touch him, be close to him. This is FAITH. Standing here, you may feel that you do not believe or understand. All the people you see feel the same. They do not know what to feel or what to say they only know that they must be there and do. They walk to that special place so that they can touch it and feel close to Our Lady. It can be compared to saying the word AMEN. It means I believe, I accept. A visit to the Grotto is an act of placing your confidence in God. The Grotto was a dirty place at the time of Bernadette. The presence of Mary lit it up like the candles you can see light it up now. The Grotto welcomes us, what was dark and dirty is now clean, smooth and full of light. The Grotto is a Sign of Hope.